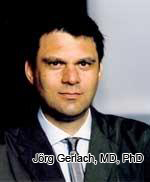 Regenerative Medicine Today welcomes Jörg Gerlach, MD, PhD. Dr. Gerlach is a Professor with the Department of Surgery at the University of Pittsburgh. Dr. Gerlach discusses his “skin cell gun” and its applicability as well as other alternatives for burn therapy. For more information about Dr. Gerlach, click here.